Landscaping Portage MI | Services | Wolverine Lawn Services, Inc.
Wolverine Lawn Services strives to give you high quality maintenance of your lawn and landscaping. Portage, MI, homeowners deserve to have a personalized landscape or yard that they can be proud of. Review our list of lawn maintenance services below. We can do everything from flower and garden designs to shrub and tree trimming. It doesn't take long for your lawn to get out of hand, so we offer consistent mowing and trimming to keep your yard orderly and looking neat. It is important that your lawn gets the nutrients it needs to stay healthy. 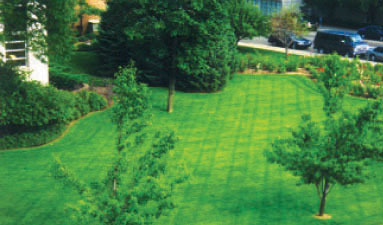 We can provide programs to keep your landscape fertilized so that your grass stays green. In order to evenly plant your lawn or garden, we offer hydroseeding to ensure every inch of your Portage property is evenly covered with all the necessary materials to start your new lawn. Keeping your soil fresh is important, and our methods and machinery will help adequately aerate your lawn to allow moisture and air to absorb into your lawn and promote root growth for healthier grass. We can plant and design beautiful flowers beds that your neighbors will be talking about. Overgrown shrubs and trees can make a yard look unkempt. Pruning and trimming trees and bushes are pivotal in keeping your home attractive and safe. A natural landscape may unfortunately bring some pests, but we can take care of them for you. Mulch gives your garden a great aesthetic and it serves as protection for your plants to keep them rooted and healthy. Fallen leaves or weeds can disturb the appearance of your landscaping. Portage, MI, residents can use our services to keep their home gardens and lawns clear.